Home / Content Marketing / What to Blog About? 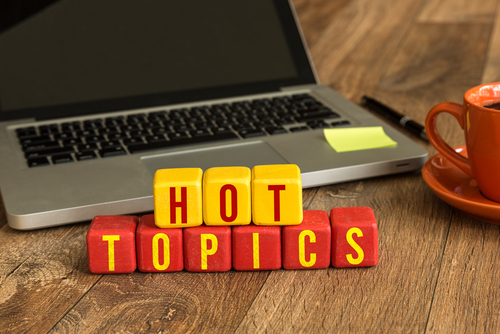 Check Out These Blog Topic Generating Tips! If you’re working on your content marketing strategy, then you know that you need regular content to be successful. That means coming up with new ideas to write about. The problem is that, after some time, it can be easy to hit a wall and have no idea what you should be writing about for the upcoming blog update – let alone all the blogs down the line. Some bloggers are lucky enough that they can talk about whatever they want, and it will fit right into the rest of their content. Others – content marketers especially – are in a difficult position where the blogs they produce need to be relevant to their brand. That means creating content of value from what can seem like a limited pool of ideas. Thankfully, it’s possible to generate blog topics with just a little time and consideration. Whether you’re planning your blog topics in advance or you’re struggling with writer’s block, check out these tips on how to find things to blog about. There are plenty of brainstorming techniques out there, and the web can be a great opportunity to come up with multiple topics at once. Commonly used in education to help students generate essay topics and connect ideas together, you start a web by picking out one or two main ideas and putting them in circles. From there, you start to generate other elements and topics through free association. As you add these ideas to your paper, you draw lines to connect related topics. Don’t hesitate to add whatever comes to mind to the web; you may find yourself drawing connections you haven’t considered before. As you gather more pieces, you can come up with a concrete topic to work with, or sometimes even several topics that can make a blog series. While struggling to figure out what to blog about can be frustrating, it’s not one that you alone face. Almost any blogger will find themselves stuck on a topic. That’s why there are numerous blog idea generators you can work with to help get the topics flowing. How these generators work varies. Most will allow you to enter keywords, then they will provide you with a list of potential topics. Some will even have more advanced features that give you information on how popular a topic is or if there are related keywords you can work with, like Buzzsumo. When in doubt, there are also tools like Alltop that just compile topics from all niches which can give you some inspiration on a new way to handle your content. If you aren’t sure what to write about, it’s always an option to see what similar blogs are working on. With so many blogs out there, it’s likely that someone’s touched on a topic that you haven’t considered yet. One strategy you can use when looking at the competition is to consider what topics they haven’t written about yet and see where your blog can fill in the gaps. Of course, it’s also possible to repurpose another blog’s idea for your own content. Of course you don’t want to write the exact same article. Your job is to then make your post unique. Is there a new angle that you could take with the topic? Are there ideas you can expand on? Is there outdated information you can update? Once you find a way to put your blog’s personal spin on a topic, you’re in good shape to not only write a new post, but also to provide new value to your readers. Writing can seem like a solitary process where you need to keep to yourself while you work, but it doesn’t have to be. When you find yourself struggling for ideas, step back and ask some others what they think would make a good topic. This can include family, friends, and coworkers alike. The greater the variety of people you have around, the more likely you are to come up with something new. Even if your friends and family aren’t experts in your blog niche, they can still help. They likely have a different perspective from you that can lead to interesting questions, which you can then explore in a post. The process of just talking ideas over can give us the spark of inspiration we need to find the right topic. Seeing what you’ve previously written can help to spark ideas, not to mention spark your memory. Perhaps you thought you covered a topic, but you missed it. Or maybe you wrote a post that could have a sequel covering another aspect – or a broad post that you could delve into more details about. You may even be able to repurpose an old topic but geared toward a new audience. Updating information is another good way to make use of your old content. If you wrote about a time-sensitive topic, like a “best of 2017,” you can write an updated version discussing the “best of 2018.” If your blog includes announcements or predictions about your company, you can also write a follow-up on how things have progressed since then. You won’t want to constantly rewrite the same style content, but a regular refresher can be nice for your new and old readers alike. Part of the challenge with creating new blog topics is that you want your ideas to appeal to your audience. What better way to guarantee that than by asking them? If your readers have left any comments about what they’d like to see next, see if there’s something you can use. You can also run a survey or even ask on social media. Gauging the responses, you can find a new idea and know that you’ll have readers when you post. Allowing for reader input also helps to engage your audience and build community, which can further boost your blog. Every blogger encounters some form of topic paralysis, but there are plenty of places to look for new ideas. Some strategies may work better for you than others, but there’s at least one way that you can find a new idea to work on. So the next time you feel stuck, try out these tips and see where they take you and your next blog post!